If you happen to encounter Windows Internet Guard installed on your PC, be quick and take effort to remove it immediately! This software is not legitimate antispyware tool, it is a danger computer parasite from family of Win32/FakeVimes misleading programs. Like other fake antispyware programs, Windows Internet Guard is distributed through the use of trojans and fake online virus scanners. These “online virus scanners” are misleading websites that simulates a system scan and claims that the user’s computer may have been infected by malware. Next, it will advise the user to download and install Windows Internet Guard to keep the computer safe and protected. Most important to know, that these online scanners are a fake. These misleading websites couldn’t possibly detect malware on your computer! When Windows Internet Guard downloaded and started, it will configure itself to start each time you logon into Windows. Once installed, it will start an imitation of full system scan and report that your computer is infected with all types of malware, trojans and viruses. Windows Internet Guard uses the real names of infections to make the scan results more realistic. However, it won’t remove those infections unless you purchase its “full version”. Please do not purchase Windows Internet Guard` full version based on anything it displays. The scan results are a fake! You may easily ignore them. Remember, in reality, your computer is infected only with Windows Internet Guard. Trojan activity detected. System integrity at risk. Full system scan is highly recommended. Like we have already mentioned above, all of these notifications are a fake and should be ignored. As you can see, Windows Internet Guard is absolutely useless, but more, it is a dangerous software. The scan results, warnings and alerts that generated by the misleading program are totally fabricated and must by no means be trusted! Use a removal instructions written below to see step-by-step guide how Windows Internet Guard can be removed manually from Windows 8, Windows 7, Windows Vista or Windows XP. The rogue will not allow you to run a malware removal tools, then you will need to reboot your computer in Safe mode with Command Prompt. When the Windows Advanced Options menu appears, select Safe mode with Command Prompt and then press ENTER. Reboot your computer in Normal Windows mode. Now you should download Malwarebytes Anti-malware and remove all Windows Internet Guard associated malware. 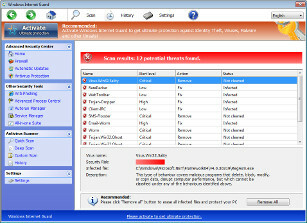 Select Perform Quick Scan, then click Scan, it will start scanning your computer for Windows Internet Guard infection. This procedure can take some time, so please be patient. Make sure that everything is checked, and click Remove Selected for start Windows Internet Guard removal process. When disinfection is completed, a log will open in Notepad and you may be prompted to Restart. Your system should now be free of the Windows Internet Guard virus. If you need help with the instructions, then post your questions in our Spyware Removal forum. Note 3: If you follow this guide above to remove Windows Antivirus Patrol let us know how you managed by sending us your comments please.